Alison Cole’s Updated Website – Worth a Long Browse! At least once a year, I get hankering for certain embroidery kits that have been floating in the back of my mind for a while. Alison Cole’s kits have been simmering and calling to me for a few years now. 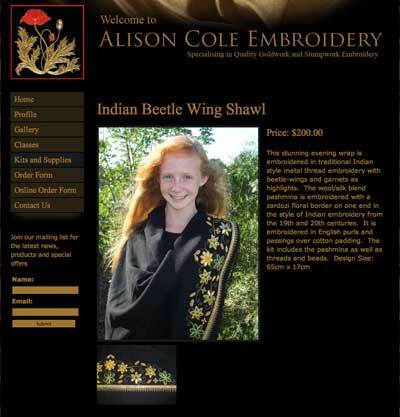 She’s recently revamped her website, Alison Cole Embroidery, and it now includes a regular online ordering system. 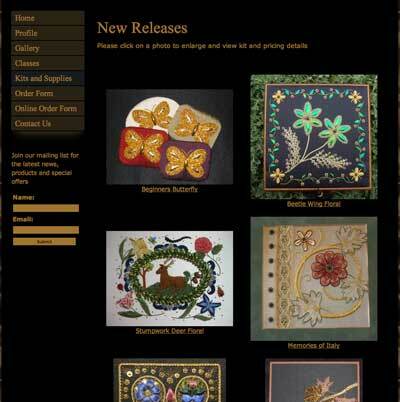 But better than that, it includes so many photos of so many beautiful goldwork and stumpwork and combined goldwork and stumpwork projects, that it’s just a wonderful website to browse! If you’re not familiar with Alison Cole, she is an Australian embroiderer who specializes in goldwork and stumpwork embroidery. Several years ago, Alison graciously allowed me to focus on her and her work in a short series of articles here on Needle ‘n Thread, focusing on needlework artists and designers. You can read all about Alison’s needlework background here, and you can read about Alison’s adventures in publishing needlework books here. There are several beautiful new goldwork and stumpwork kits on Alison’s site, and several have caught my poor, easily-distracted, roving eye. I think Memories of Italy is beautiful. You can click on her pictures on the site to view larger images of each piece, and it’s really worth doing, to see the detail. And I’m quite twitterpated with the Indian Beetle Wing Shawl. The edge is lovely, and the use of beetle wings in embroidery has fascinated me for a long time. 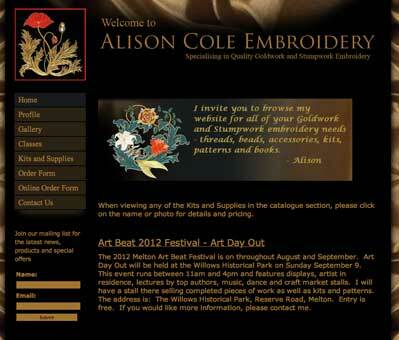 If you have any time this weekend for some inspirational browsing, check out Alison Cole Embroidery! It’s sure to get the Juices flowing! Alison’s beautiful designs make for wonderful eye candy, don’t they? I’ve been ordering from Alison for years now and her site is one I have always enjoyed visiting. The updated website is beautiful and her kits are just wonderful – I’ve finished four now and am trying to decide which one to do next. The are so beautiful when they are finished. Funny you should mention beetle wings. Evidentally I “found” your website after you had your conversation on them. I live very close to Shipwreck Beads and occasionally go (talk about your distractions!! )just to enjoy the scenery. Last time I went they had a bowl of these beetle wings. I bought a handful of them just because they were so beautiful. I had no idea!….. ‘scuse me, I am on my way to Alison’s website….. Her kits are just gorgeous! I browsed everything and was on the verge of placing an order when I saw the $30.00US shipping cost. Heavens to Mergatroid! It’s too bad she doesn’t have a retail presence here. Her work is so beautiful! I am an avid reader of your blog for a little over a year. You have allowed me to approach the practice of embroidery, which I do not know anyone around me who can help me. And I wanted so much! I read your article on the book’s create one of your reader for his personal needs. Never doubt the importance you have for people like me who are attentive to your projects, your advice is so generous, especially never doubt. And continue to write everything, but really all you want to write. If some do not like, you bring so much to so many other people it is important not to doubt you. I am a beginner in embroidery and I hope to soon make embroidery and jewelery ………… it is thanks to you. I enrolled in a class of cyber Alison Cole and I am really pleased and again you have me motivated for this form of embroidery so interesting. Je suis une lectrice assidue de votre blog depuis un peu plus d’un an. Vous m’avez permis d’approcher la pratique de la broderie, moi qui ne connais personne autour de moi qui peut m’aider. Et j’en avais tellement envie ! J’ai lu votre article sur le livre qu’a créer l’une de vos lectrice pour ses besoins personnels. Ne doutez jamais de l’importance que vous avez pour les personnes comme moi qui sont attentifs à vos projets, vos conseils si généreux, surtout n’en doutez jamais. Et continuez à écrire tout, mais vraiment tout ce que vous avez envie d’écrire. Si quelques- uns n’apprécient pas, vous apportez tellement à tellement d’autres personnes qu’il ne faut surtout pas douter de vous. Je suis une débutante en broderie et j’espère pouvoir bientôt réaliser de la broderie orfèvrerie et ………… c’est grâce à vous. Je me suis inscrite à une cyber classe d’Alison Cole et j’en suis vraiment ravie et là encore vous m’avez motivée pour cette forme de broderie tellement intéressante.